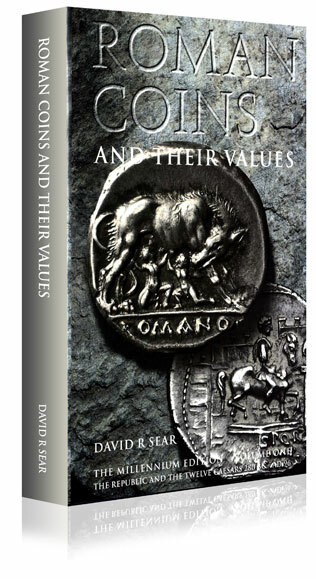 Roman Coins and Their Values, Volume I: The Republic and the Twelve Caesars 280 BC - AD 96 by David R Sear. The original edition of Sear’s Roman Coins and Their Values was published by Seaby thirty-six years ago and has been through four revisions (1970, 1974, 1981 and 1988). However, the publication of the "Millennium Edition” of this popular work makes a radical departure from previous editions. The catalogue entries have been expanded to include a virtually complete listing of the entire Roman Republican series, as well as more comprehensive coverage of the much larger and more complex Imperial series. Greater emphasis is now placed on the precise chronology and place of mintage of each type and extensive coverage is given to the important series of billon and bronze coins struck at Alexandria over a period of more than 300 years. The valuations have been exhaustively researched from recent auction records and fixed price catalogues and many professional numismatists have contributed their valuable opinions on specific series. Prices (both in British pounds and US dollars) are now expressed in either two or three grades of preservation for each entry, usually "VF” and "EFï” for precious metal issues, and "F”, "VF” and "EFï” for Imperial Bronzes. Perhaps most importantly for the collector, the number of photographic illustrations in the text has been increased, and their quality improved. Expansion on this scale has inevitably led to a need to divide the work into more than one volume, but collectors and dealers will now find it of much greater value both as a source of information and as a comprehensive work of reference for this vast and complex series.